If you find the old fashioned method of making fudge daunting, you will love this rich and creamy Simple Chocolate Fudge recipe. It side steps the boiling of sugar syrup and instead, all you need to do is melt semi sweet chocolate with a little butter and sweetened condensed milk. Finish it off by stirring in some vanilla extract and chopped nuts and you are done. I often like to use more than one type of nut, my favorites being hazelnuts, almonds, and pistachios. But peanuts, walnuts, and pecans are very nice, or you could even fold in some dried fruit. So, lets begin. All you need to do is slowly heat the sweetened condensed milk with the finely chopped chocolate and butter in a heatproof bowl, placed over a saucepan of simmering water, until the chocolate has melted and the mixture is smooth. Then remove from heat, stir in the vanilla extract and nuts, and spread into your pan. It is important to use a good quality chocolate that you enjoy eating out of hand. There are many good brands of chocolate on the market today, both foreign and domestic. Taste the chocolate before using as not all chocolates are the same. Although the professionals swear by the high end bittersweet chocolates, these are not for everyone as their taste can often be too bitter for some palates. So keep this in mind when giving fudge as gifts or when serving to children. 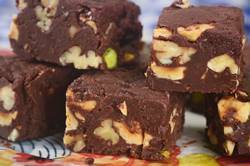 For a little trivia, fudge making seems to have started with young American women on college campuses in the 1890s. There are many theories as to why it was called 'fudge'. Andrew F. Smith in "The Oxford Companion to American Food and Drink" suggests the name "refers to an expression young women might have used instead of swearing". To toast nuts: Preheat oven to 350 degrees F (177 degrees C) and place rack in center of oven. If using hazelnuts, place them on a baking sheet and bake for about 15 minutes or until the nuts are fragrant and their skins start to blister. Remove from oven and place in a clean kitchen towel. Roll up the towel and let the nuts steam for five minutes and then rub nuts to remove skins. Let cool and then chop into pieces. If using almonds, pecans or walnuts toast the nuts for about 8 minutes, or until lightly brown and fragrant. Cool and then chop coarsely. Chocolate Fudge: First line the bottom and sides of an 8 or 9 inch square baking pan (20 or 23 cm) with aluminum foil. Combine the condensed milk, chopped chocolate, and butter in a heatproof bowl and place over a saucepan of simmering water. Melt the chocolate mixture, stirring frequently, making sure the mixture doesn't get too hot or the fudge may be grainy. Stir until smooth (it will be very thick). Remove from heat and stir in the vanilla extract and chopped nuts. Spread the fudge into the prepared pan, smoothing the top with an offset spatula. Let stand at room temperature until cool (this can take several hours). Then carefully remove the fudge from the pan by lifting the edges of the foil. With a long, sharp knife cut the fudge into one inch (2.5 cm) pieces. Store in the refrigerator for several days or freeze, well wrapped, for several months. Let thaw at room temperature, unwrapped, for a few hours before serving. Preparation time 45 minutes. Heatter, Maida. Maida Heatter's Cookies. New York: Cader Books, 1997. Luchetti, Emily. Four-Star Desserts. New York; Harper Collins Publishers, 1996. Willan, Anne. LaVarenne Pratique. New York: Crown Publishers, Inc., 1989.